You can find us in the heart of Godmanchester in East Chadley Lane. The SatNav postcode is PE29 2BJ. Parking in the streets around our Church Centre can be challenging and we have a commitment to our neighbours not to park on East Chadley Lane or Lancaster Way. To make things as easy as possible this is our advice on the best places to park. Please allow a few more minutes to arrive so you can park away from the building. When you park, please be very careful not to block driveways, some of which do not have dropped curbs, or obstruct access for emergency vehicles. You can use the Comrades Club Car Park in St Ann’s Lane (PE29 2AY) – but only on a Sunday morning please. You can also use the car park at the Godmanchester Community Academy (PE29 2AG) between 10am and 1pm – again only on a Sunday morning. We have a Car Parking team who wear hi-viz vests and name badges to help you find a suitable parking space. People who have particular medical or mobility issues are being issued with parking permits for our car park. The church car park is available only for people with mobility difficulties or for those giving people organised lifts. Please don’t double park in the car park at all during Songs of Praise as we need that space for getting people safely in and out of cars. Our car park other than on Sundays. 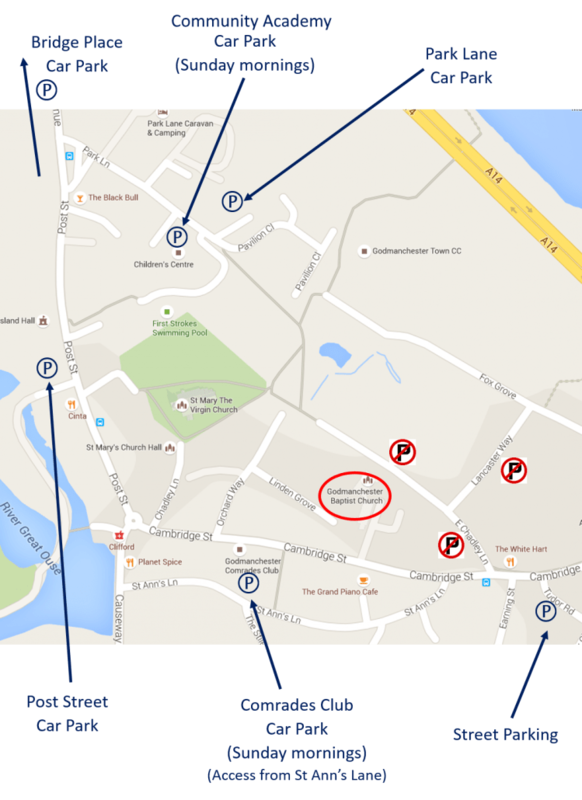 Our car park off East Chadley Road has about 15 spaces, disabled parking bays and a cycle rack. There is no drop off or parking available from the Clyde Yard end of the site. East Chadley Lane and Lancaster Way. It is difficult to park in these roads without causing disputes with some of our neighbours. Clyde Yard. Clyde Yard is private property and we don’t have permission to park there. Comrades Club Car Park and the Godmanchester Community Academy Car Park other than on Sunday mornings.